The Mediterranean diet is based upon the eating patterns of traditional cultures in the Mediterranean region. Several noted nutritionists and research projects have concluded that this diet is one of the most healthful in the world in terms of preventing such illnesses as heart disease and cancer, and increasing life expectancy. The countries that have inspired the Mediterranean diet all surround the Mediterranean Sea. These cultures have eating habits that developed over thousands of years. In Europe, parts of Italy, Greece, Portugal, Spain, and southern France adhere to principles of the Mediterranean diet, as do Morocco and Tunisia in North Africa. Parts of the Balkan region and Turkey follow the diet, as well as Middle Eastern countries like Lebanon and Syria. The Mediterranean region is warm and sunny, and produces large supplies of fresh fruits and vegetables almost year round that people eat many times per day. Wine, bread, olive oil, nuts, and legumes (beans and lentils) are other staples of the region, and the Mediterranean Sea has historically yielded abundant fish. The preparation and sharing of meals is a very important and festive part of Mediterranean culture as well, and Mediterranean cuisine is popular around the world for its flavors. American interest in the therapeutic qualities of the Mediterranean diet began back in the late 1950s, when medical researchers started to link the occurrence of heart disease with diet. Dr. Ancel Keys performed an epidemiological analysis of diets around the world. Epidemiology is the branch of public health that studies the patterns of diseases and their potential causes among populations as a whole. Keys’ study, entitled the Seven Countries Study, is considered one of the greatest epidemiological studies ever performed. In it, Keys gathered data on heart disease and its potential causes from nearly 13,000 men in Greece, Italy, Croatia, Serbia, Japan, Finland, the Netherlands, and the United States. The study was conducted over decades. It concluded that the Mediterranean people in the study enjoyed some significant health advantages. The Mediterranean groups had lower mortality rates in all age brackets and from all causes, particularly from heart disease. For instance, the rates of heart disease for Greek men aged 50–54 were 90% lower than for a comparable group of Americans. 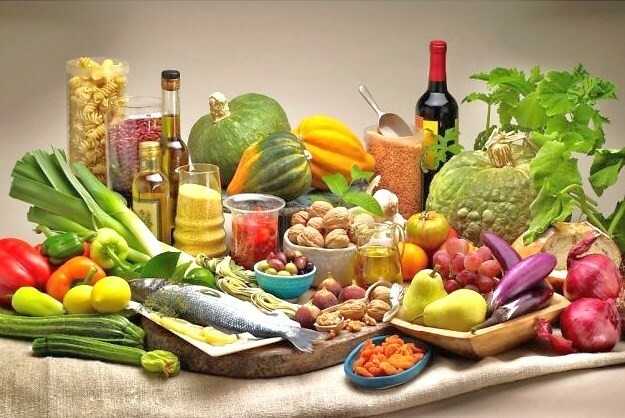 The study also showed that the Mediterranean diet is as high or higher in fat than other diets, obtaining up to 40% of all its calories from fat. It has, however, different patterns of fat intake. Mediterranean cooking uses smaller amounts of saturated fat and higher amounts of unsaturated fat, mostly in the form of olive oil. Saturated fats are fats that are found principally in meat and dairy products, although avocados, some nuts and some vegetable oils also contain them. Saturated fats are used by the body to make cholesterol, and high levels of cholesterol have since been directly related to heart disease. Several other studies have validated Keys’ findings regarding the good health of people in the Mediterranean countries. The World Health Organization (WHO) showed in a 1990 analysis that four major Mediterranean countries (Spain, Greece, France, and Italy) have longer life expectancies and lower rates of heart disease and cancer than other European countries and America. The data are significant because the same Mediterraneans frequently smoke and don’t have regular exercise programs like many Americans, which means that other variables may be responsible. Scientists have also ruled out genetic differences, because Mediterraneans who move to other countries tend to lose their health advantages. These findings suggest that diet and lifestyle are major factors. A 1994 study conducted in France found that the rate of heart attacks and the rate of cardiac deaths were lower for the Mediterranean diet group than for a group of controls. The Mediterranean diet gained more notice when Dr. Walter Willett, head of the nutrition department at Harvard University, began to recommend it. 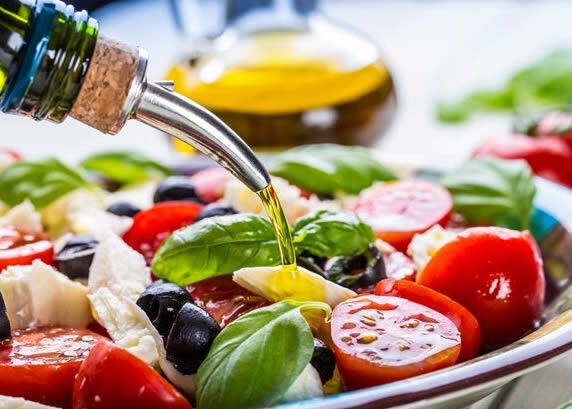 Although low-fat diets were recommended for heart disease, Mediterranean groups in his studies had very high intakes of fat, mainly from olive oil. Willett and others proposed that the risk of heart disease can be reduced by increasing one type of dietary fat—monounsaturated fat. This is the type of fat in olive oil. Willett’s proposal went against conventional nutritional recommendations to reduce all fat in the diet. It has been shown that unsaturated fats raise the level of HDL cholesterol, which is sometimes called “good cholesterol” because of its protective effect against heart disease. Willett has also performed studies correlating the intake of meat with heart disease and cancer. 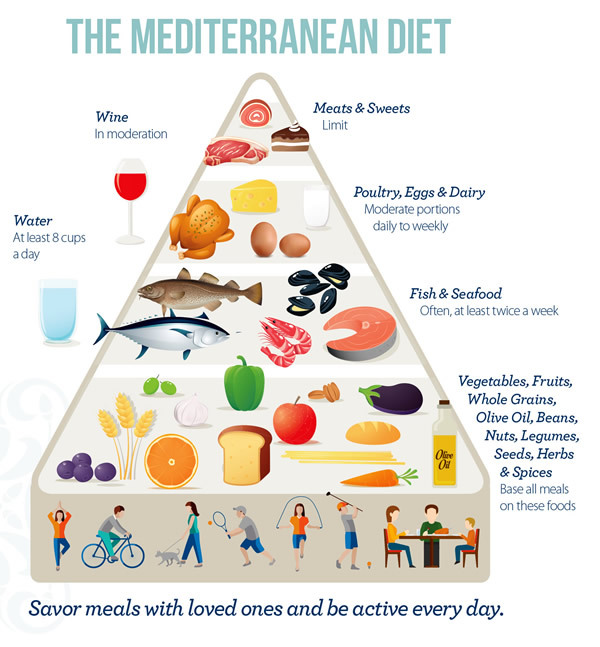 Willett, other researchers at Harvard, and the WHO collaborated in 1994 and designed the Mediterranean Food Pyramid, which lists food groups and their recommended daily servings in the Mediterranean diet. These nutritionists consider their food groups a more healthful alternative to the food groups designated by the U.S. Department of Agriculture (USDA). The USDA recommends a much higher number of daily servings of meat and dairy products, which Mediterranean diet specialists attribute to political factors rather than sound nutritional analysis. The Mediterranean diet is a recommended preventive diet for heart disease, strokes, cancer, and the improvement of general health. The diet offers foods that are tasty, economical, and easy to prepare. Another benefit is that many people are more familiar with purchasing, preparing, and eating Mediterranean foods than some foods that are central to other dietary therapies. The bulk of the diet comes from plant sources, including whole grains, breads, pasta, polenta (from corn), bulgur and couscous (from wheat), rice, potatoes, fruits, vegetables, legumes (beans and lentils), seeds, and nuts. Eggs are used sparingly, up to four eggs per week. Wine is consumed in moderate amounts with meals (1–2 glasses daily). American consumers may find equivalents by shopping in farmers’markets and health food stores that sell organic produce. Meat intake should be reduced and replaced by whole grains, legumes, and other foods at meals. The dairy products that are used should be yogurt and cheese instead of milk, which is not often used as a beverage by Mediterraneans. Researchers have been quick to point out that there may be other factors that influence the effectiveness of the Mediterranean diet. Getting plenty of physical exercise is important, as is reducing stress. Researchers have noted that Mediterraneans’ attitude toward eating and mealtimes may be a factor in their good health as well. Meals are regarded as important and joyful occasions, are prepared carefully and tastefully, and are shared with family and friends. In many Mediterranean countries, people generally relax or take a short nap (siesta) after lunch, the largest meal of the day. Although wine is recommended with meals in the Mediterranean diet, those with health conditions and restrictions should use caution. The diet allows generous quantities of olive oil, but only when the olive oil substitutes for other fats and is not used in addition to them. In other words, consumers may have to significantly reduce fat intake from meat and dairy products, margarine, cooking oils, and other sources.